I know it has been a while since I posted but I have been busy. My girlfriend was up for a week and we did Christmas decorations. So now I am all decorated for the holidays only some baking left to do. We are having Christmas here on the 20th so I need to get the baking done soon. I don't want to wait until the last minute. Cookies and candy are on my list of things to get ready. I am going to make turkey soup and chili, very non-traditional meal don't you think? 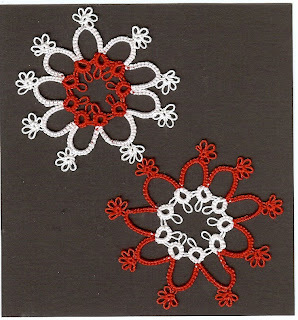 I made these to red and white snowflakes and I have one other white one to post. I am sending the one to my sister in Nebraska. She will be surprised! She has been crocheting snowflakes and will be excited to get a tatted one as she has no idea on how to tat. I hope to have enough made so everyone can take one home on the 20th. I think I am going to have enough with a few extra. That is always a good thing to have extra's you never now when you might need one for a gift for someone unexpected.